There are 12294 posts in this topic. You are on page 1 of 246. 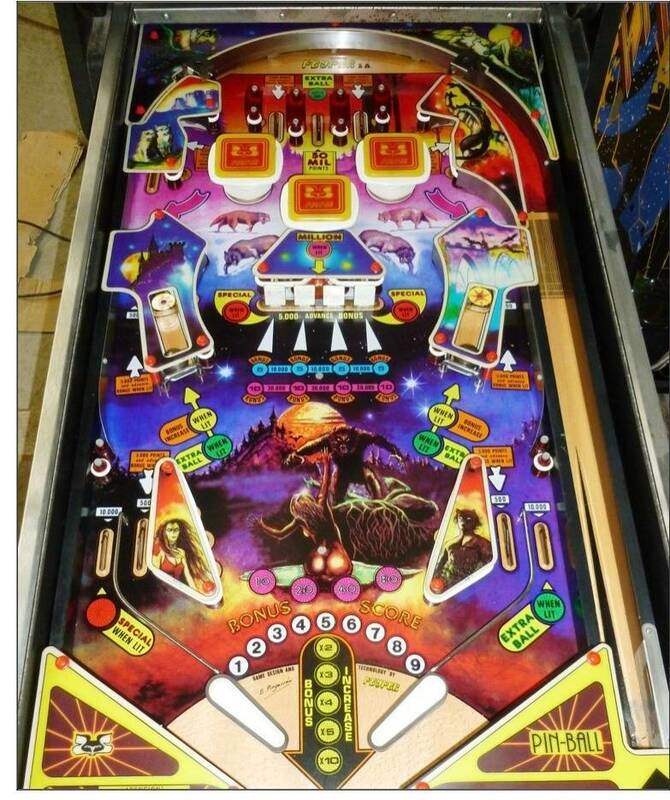 Do you love restoring pinballs? 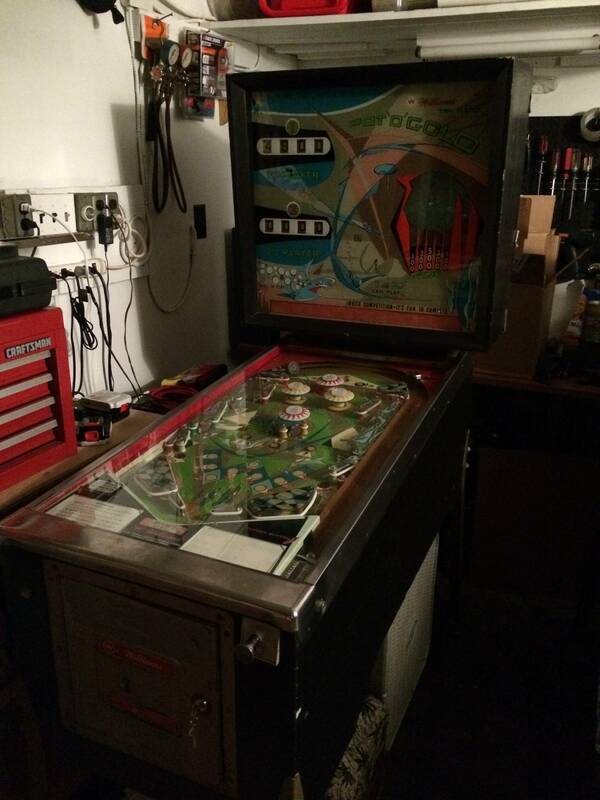 Is resurrecting a pinball machine bound for the dumpster one of your life's missions? Maybe you just love a bargain or can't afford those 'nicer' pins. Whatever the reason, this is the hangout to post project machines you have found or any that you have for sale. 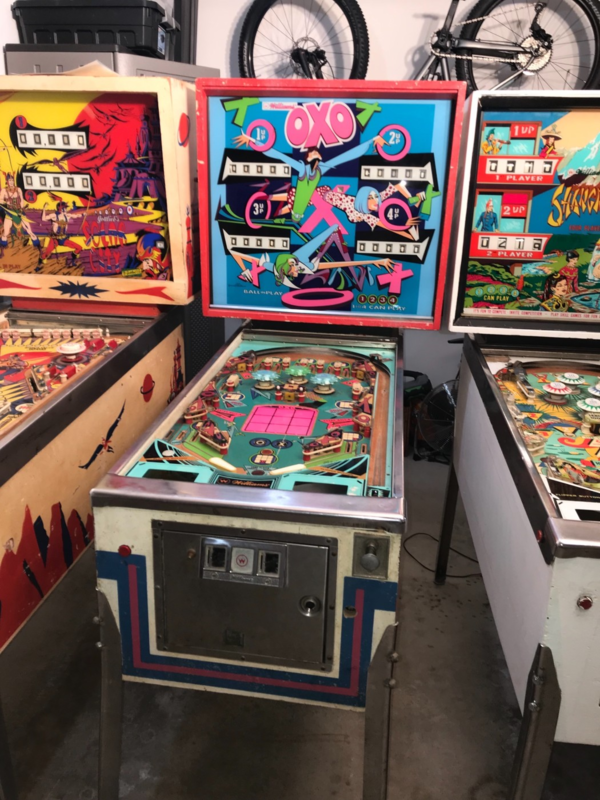 Project pinball machines listed on Pinside, CL, eBay or all others with contact information appropriate. Please be courteous and thank/upvote the original poster if you find the post helpful. Please list Manufacturer, game name/type, year, cost and location in the pinball machine in the post. 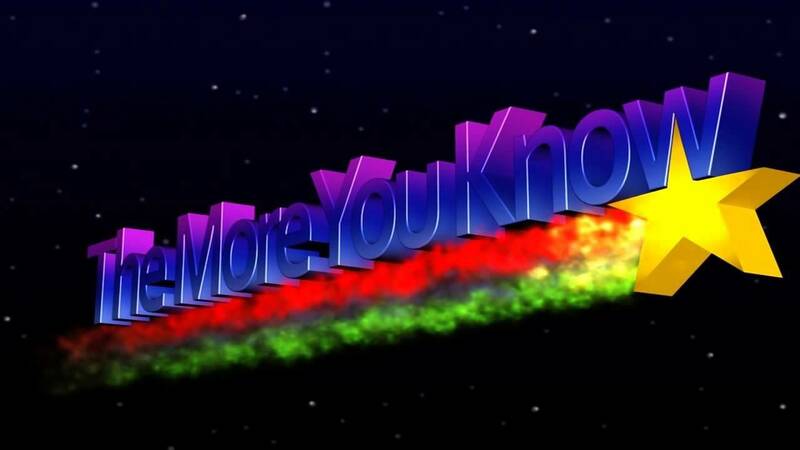 And, of course, post a link or contact information. Please also add any major defects/problems or major positives. My hope is that project pinballs can find a good home with a Pinsider who will treat it with the care and respect that these old works of art and mechanical magnificence deserve. If you only want to post a link, do so - only guidelines here. But please be aware that any additional information you can add will save others from clicking a link to a trashed machine they have no interest in. As always Caveat Emptor! Be careful out there! Go get 'EM guys and gals! This posting on CL has been around for months. The seller didn't respond to my first offer, but responded to my second. He has now updated the ad with pictures of the pins and combined the four pins into one package. I am posting it here for you hard-core restoration guys/gals. There are no plug and play pins as far as I can tell. This could be a real bargain for the right buyer - definitely project machines here! Condition: Unknown, appears to be Fair. Boards seem to be intact. Condition: Needs PF Motor @ $110. Playfied and backglass look nice. Condition: OP says "Works - needs cleaned up / playfield has been disassembled"
Condition: OP says "Rough" - no pics. 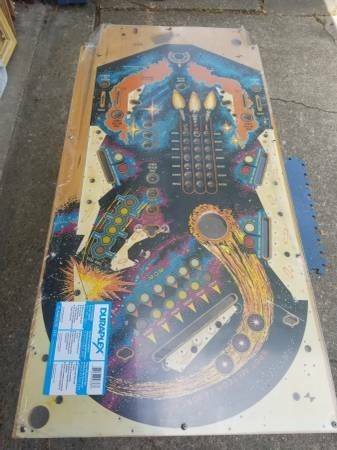 Williams Flash cabinet - has been sanded by previous owner - Has Body, playfield with some parts, head and backglass - see ad for pics. OP says to bring truck and cash so don't expect him to ship. Condition: Lots of flaking on top of backglass. Art looks Fair or better on playfield. Playfield parts have been removed. Cabinet is rough in front but backbox and cabinet sides appear to be Fair-Good. Condition: This is another older CL listing. Project in mid-restoration. OP says he has more than $1,000 into machine. Boards have been repaired. New translite and playfield overlay. Inserts have been leveled with new decals. Playfield has been stripped of parts. Condition: Missing back door, cabinet glass and one side rail. Free local pick-up or will ship - buyer pays for packing and shipping. Majestic was the first pinball machine to have disk roto-targets. Condition: OP: "Project, no Backglass." Condition: No backglass, Game lights up, but will not play a game. Play-field has some wear but looks pretty good in picture. Plastics are okay. Cabinet is decent with dings, chips, and scuffs. Game is dirty. $259 shipping. Condition: Playfield has some moderate wear. Plywood on front of cabinet delaminated, missing parts of top layer of wood. Works with all lights. Backglass appears to have some minor flaking - judge for yourself. Coin assy not operating. Unit has some weathering since it has been on the patio. Have some extra parts including solenoids, rubber, pinball, etc. 'Big Deal' is the first use of a bank of drop targets on a Williams game. Projects are largely posted in the respective Craigslist and Ebay threads already, I'd guess most people in the market for Craigslist/Ebay games are expecting to tear it apart and fix it up anyway, at least in the EM threads. Since the term "nice" is in the title of all of those threads, I thought that this thread would be a good place to post pins that were "not so nice." Besides, some of us don't want to wade through posts of nice machines that we can't afford. It was not my intention to step on any toes. Condition: Not working. OP says "Everything is in great shape especially the playing field." That might be a bit of an exaggeration after looking at the pictures. Playfield appears to be very dirty but might clean up nicely. Lots of elbow grease needed to clean this one up. Backbox is unattached? Condition: Project machine - not working. OP says " It is in well used condition except the back glass which is beautiful. " No pics. Convertible to AAB. Condition: For parts or project. 10% of parts have been cannibalized. Playfield is rough. Cabinet it repainted and rough. Plastics are "mint." OP considers game "probably beyond repair, but there is" sic (are) "a ton of excellent parts in there." Schematics and paperwork come with machine. Condition: Almost all artwork on playfield is gone. Backglass looks good. Cabinet needs bottom replaced. Two of three pop bumper caps appear to be broken. OP: "This would be a good candidate for an overlay or a retheme if someone wants to apply original artwork to the playfield." "All offers are welcome and encouraged." 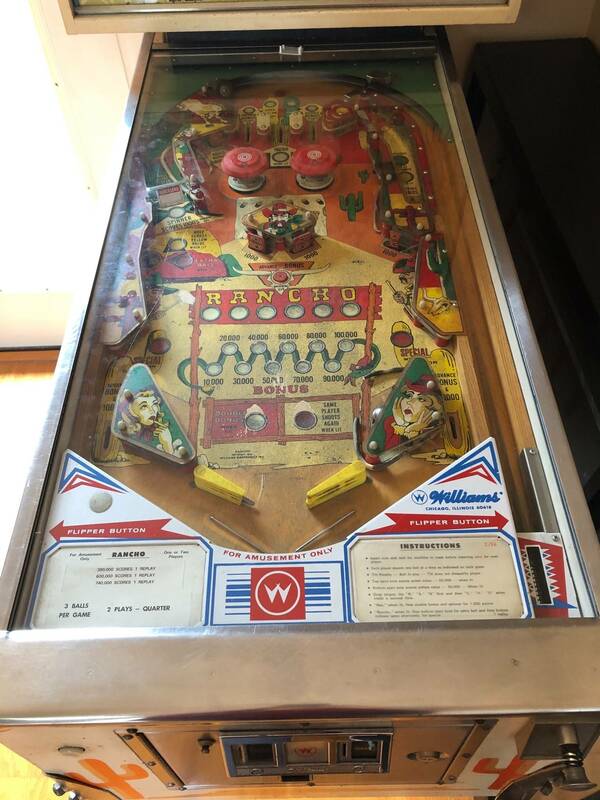 Condition: Flippers, one pop bumper cap and other playfield parts appear to be missing. Unknown whether missing parts come with machine. Seller wants a quick sale. Condition: This machine looks very clean and intact, but needs stepper units, mechs cleaned. OP calls it a "project" but sounds more like a machine that just needs a good mechanical cleaning and tuning. Really looks beautiful in the pics - you can decide for yourself. 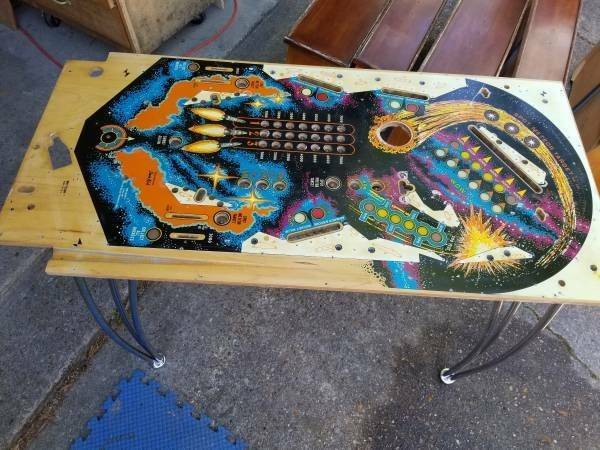 Condition: OP: "...a major Project EM Pinball machine Paddock. The GI comes on but game does not start, it keeps blowing a fuse. All the parts and pieces are there." Condition: First Gottlieb SS. Cabinet has typical wear for age. 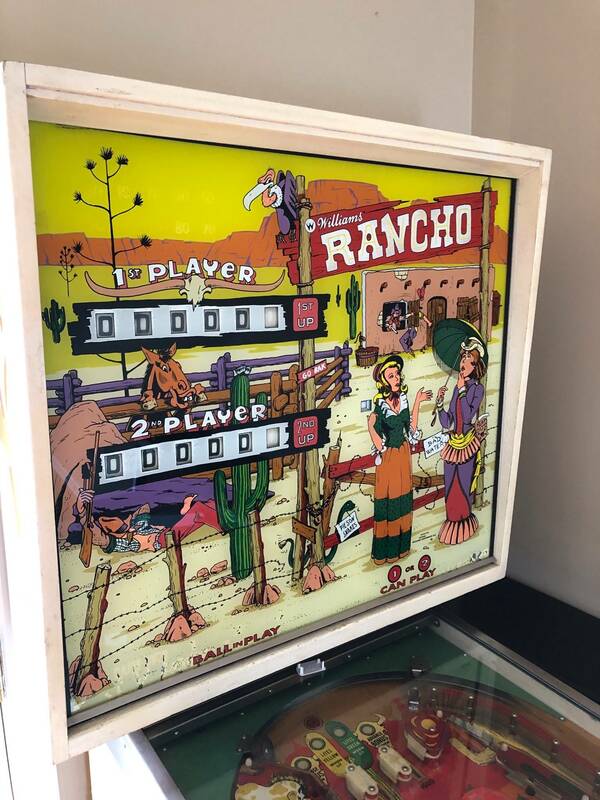 Backglass and playfield look good. "Likely need a new MPU." Shopped. Seller will ship - buyer pays and arranges for shipping. Condition: OP: "it boots and starts game but reels dont work." 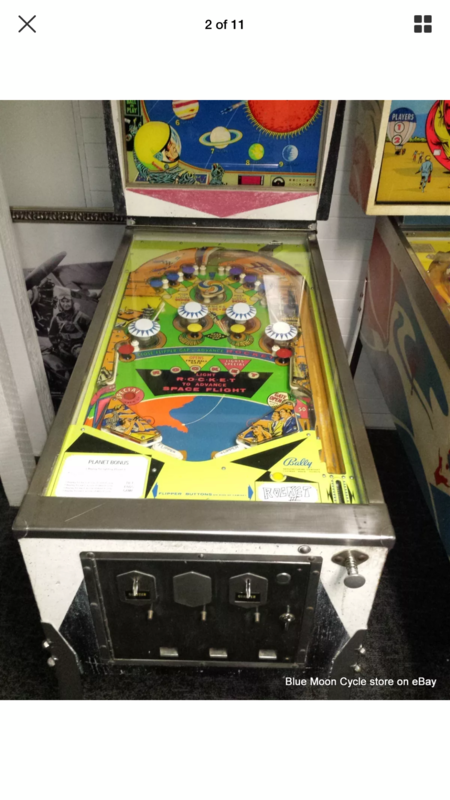 There is some playfield right flipper wear, but game appears, from low-res pictures, to be in good shape. Condition: OP: "...rubber bands are dry. I think some loose wires. it comes with the manual, spare balls and extra solenoids." Play is intermittent. Targets sometime jam. Seller will palletize for $50 and ship for $100 to McAllen TX, Laredo TX and Los Angeles CA. Condition: OP: "game is a parts game or project please call and i will explain also have another starship for sale"
This is a six player machine. Production: 2,200 initially and either 242 or 600 on the second run. Condition: OP: "game needs display and reboots call would like to trade for Whirlwind or earthshaker"
Condition: Stored in damp conditions but not in water. Some "common" ICs missing from MPU. Some Flaking on backglass. PF and cabinet unknown. This machine would go well next to my OXO, or yours for that matter. Condition: OP: "Powers up and will reset and start a game but doesn't work fully. Needs to be cleaned and adjusted/serviced. Sold as a project. In very good cosmetic condition." 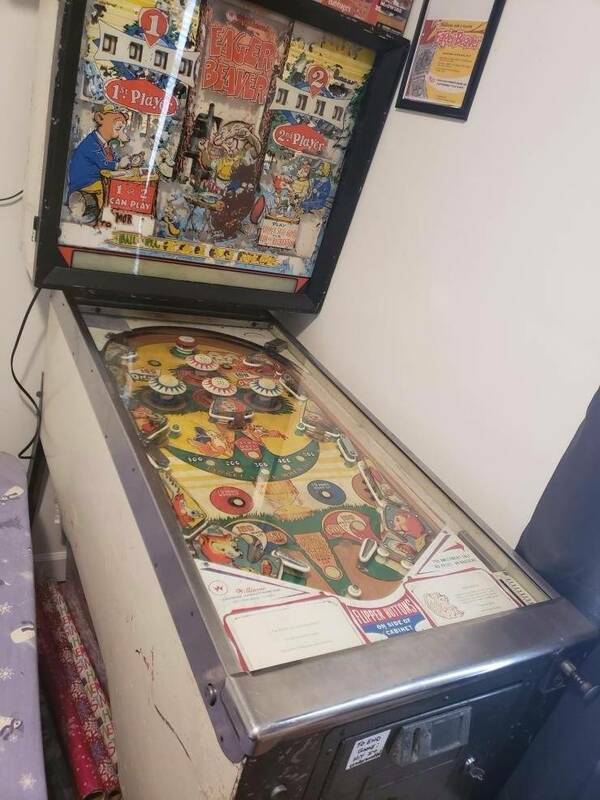 From pics: playfield and cabinet appear to be in good condition and backglass in fair to good condition. Condition: Entire game is in poor condition. Playfield missing artwork. Cabinet delaminated. Backglass cracked. Someone, please put this one out of its misery. Condition: Was working until moved. 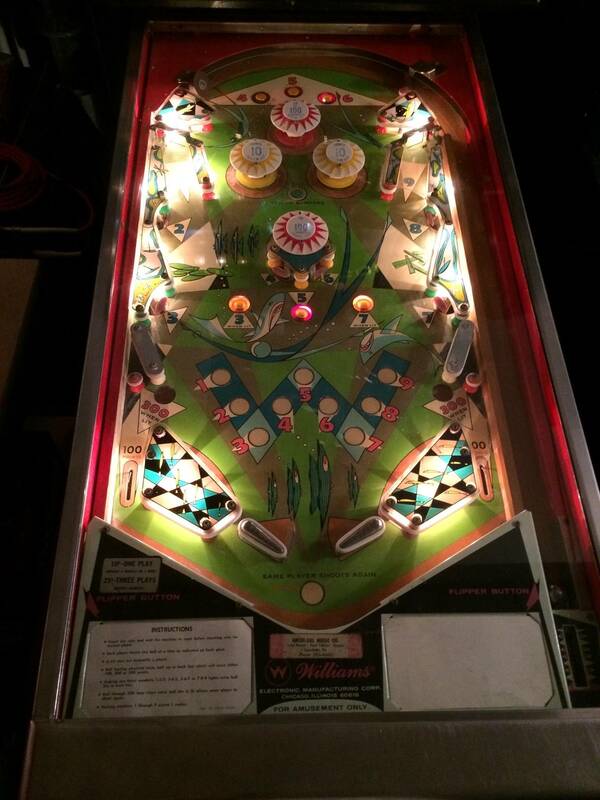 OP: "The playfield is in great shape no major wear or planking. There is one plastic that has the corner broken on which you can see in the picture. The cabinet is ok but a board has seperated on the lower cabinet as if the glue failed. The paint is not bad for the age. Backglass is not terrible I personally have machines that are way worse." How can you go wrong at $150? This would be a great first time project for someone in the NJ area or a cheap pickup for a collector. Star Trip Cocktail on Ebay in Kentucky. This ad has been on CL for a long time. He's looking for trades but also has prices listed. Condition: OP: "Project used to work before stored tried to plug back in and nothing all lights come on and it cycles I know when it used to work it needed display so if you can get it working again it will definitely needs both displays replaced." I'll try to watch for projects to post here. Good idea for a thread. It's missing the flippers and some art. Might make a nice coffee table. I saw that cocktail pin and decided not to post it because it was missing so much. But you are right, it could be a nice conversation piece of art or parts machine. Thanks for adding it. A lot of these machines hang around for a while before being purchased. It's nice as a buyer not having to be the first in a long line of buyers or constantly looking for deals. Of course, that has a lot to do with pricing. Some of these sellers want to sell their projects for working pin prices! Perhaps a little bit of "education" is required with appropriate offers. 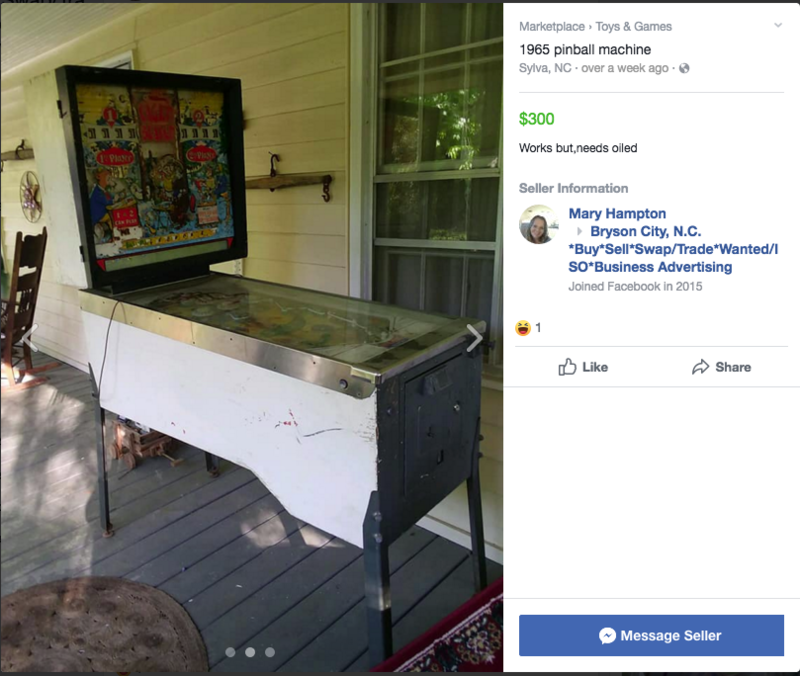 I often want to end these posts with "for the right person, this pinball would be a great purchase." Project pinball machines aren't for everybody, but for some of us, they are a diamond in the rough just waiting to be brought back to life. Thanks again for the projects you have found and posted. Condition: Not working - ball won't kick out. Looks nice. Condition: Needs a new driver board. A few bad spots on backglass. Playfield and cabinet art looks good. Edit: Similar ad in Tallahassee Craigslist has been pulled so this one is likely gone. **Sold for $203.50** Thanks Ryan! Cost: $47.00 starting bid, ends Oct 9th 7:35 PM PST. Sold for $203.50. Condition: OP: "This is a non working project game. Wires in harness going to the head in the back were cut. See picture. The game is complete . Backglass has some flaking in the white area around score reels.. Playfield has small amount of flaking Coin entry plate is cracked. Lock down bar and top glass are included, not shown in pictures. This game has been in dry storage in my garage for over 20 years. Needs a little cleaning and TLC. High bidder will need to pick this game up. 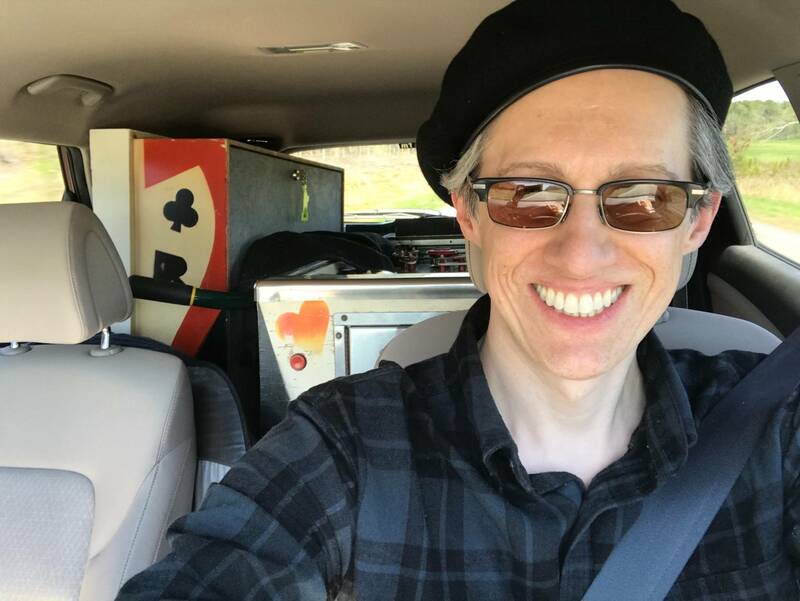 I can deliver to Pinball Expo for $50." Cost: $10.50 current bid. Ends Monday Oct. 5 @ 6:27 AM PST. Sold for $158.00. Condition: Not working. PF has a small thumbnail sized spot worn to the wood. Backglass appears to have some flaking. Cost: $97.00 starting bid Ends Friday Oct. 9 7:13 PM PST. Sold for $207.50. Condition: Not working - score motor runs continually. PF has some planking. Backglass has some flaking in the pink and yellow parts of the horse. OP: "Front door is missing the coin switches. Cost: $97.00 starting bid Ends Friday Oct. 9 7:51 PM PST. Sold for $182.51. Condition: OP: "mostly working project." Backglass has some minor flaking in the yellow parts. Playfield in good condition. Mechs inside cabinet very clean and on blue painted board in bottom of cabinet. 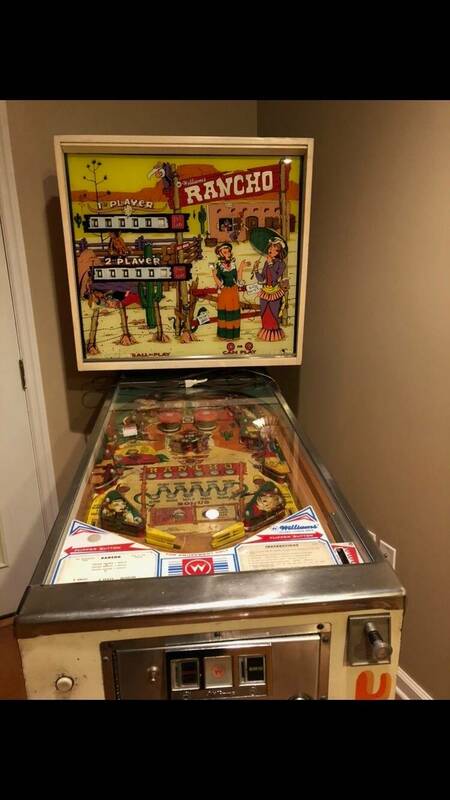 This game looks great for a 1968 machine. 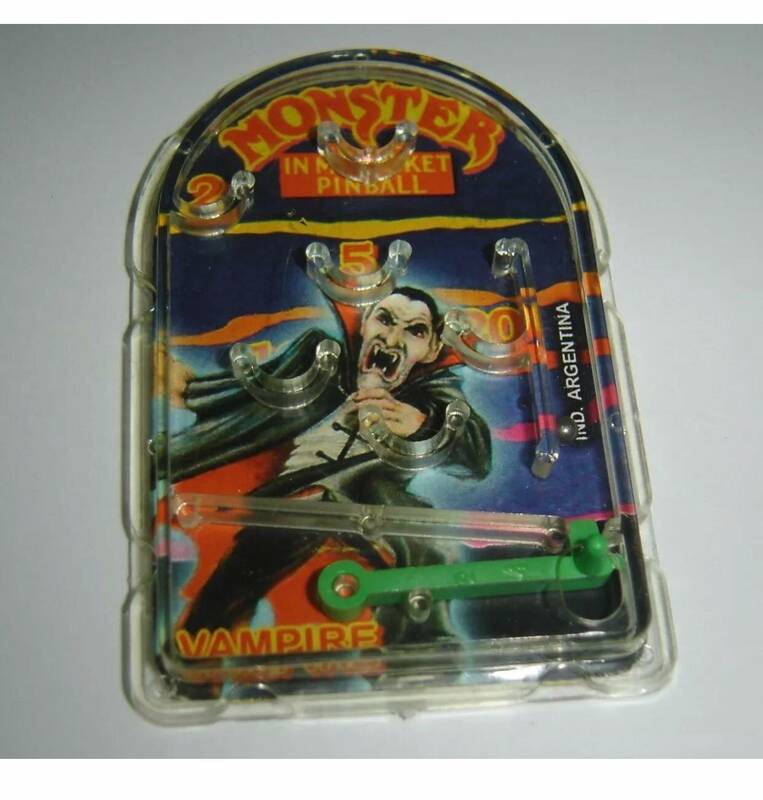 This game has zipper flipppers. Cost: $0.99 starting bid - reserve not met. Buy it now for $60.00. Ends Saturday Oct. 3 5:20 PM PST. Condition: OP: "No backglass. Playfield is actually very nice. It is very dirty, but shows very little wear. Plastics are pretty nice, just dirty. Cabinet is ok. There is no playfield glasss! Include original wood legs. Plug is broken off cord, so this has not been tested." Condition: Chloride is located in Mohave County, Arizona and is closer to Las Vegas than Phoenix. Condition is unknown and hard to tell from picture whether it is project or not - no information given. It's been listed for 29 days and, I believe, reduced from $400 to $250. It's worth a look if you are interested. Here's a Buck Rogers $200. Rob Craig is the seller. I don't know him but seems nice from his Youtube video. The game has no circuit boards. Condition: Needs MPU and driver boards. No picture. I emailed him to see if he was making the trip to Expo, which isn't. Believe 200 for this game is a steal, just have to buy the repo boards for the head. Cost: Negotiable, OP: "please don't expect me to sell it to you for $100 just because it isn't working." Condition: Not working. No pictures. Cost: $99.00 Starting bid. Ends Thursday October 8th 6:15 AM PST. Condition: OP: "This game needs a lot of work but is good for parts." I have a project Jokerz game in addition to the one listed here. I just posted some pictures of the projects machine. It is missing the CPU and other boards. I think just the interconnector board is there. I'd take $450 for the whole thing but I have some Pinsiders interested in parts so I might hack it up some more if it isn't claimed. 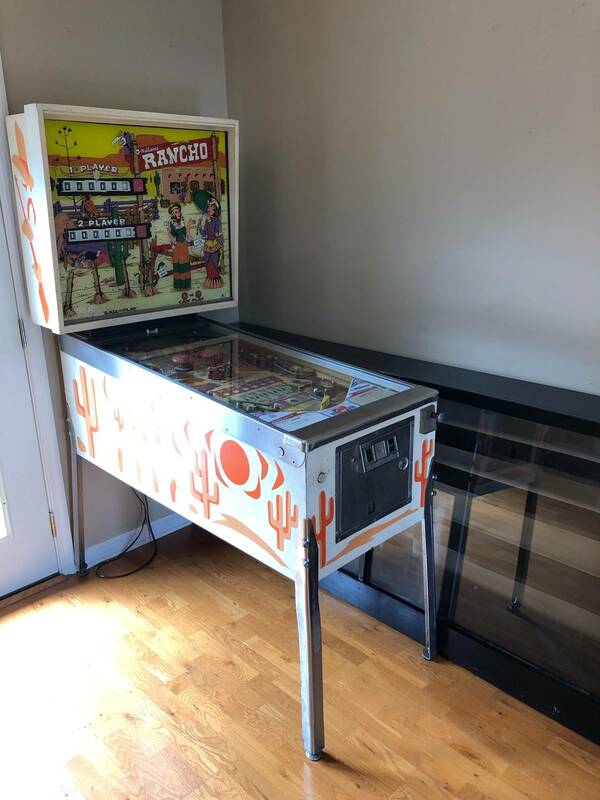 1959 Gottlieb Atlas Pinball Machine For Sale. This was a restoration project that I had started but haven't had the time to finish. I literally just put maybe 4 hrs into it removing the playfield plastics and cleaning it up. I haven't tried to power it on since it needed a new power cord and fuses. This will make a very nice example of this game if somebody wants to finish it. I really don't think it would take a lot to get it flipping. Backglass in good shape with very minor flaking. Solid playfield with very few wear spots. No major damage noticed anywhere. All original schematics in tact. Everything seems to be in order mechanically. Sling plastics and center plastic are warped due to the age. I have high quality scans of the original artwork that can be used to make repro plastics. Very common defect for older machines. Legs could stand to be stripped and repainted. I didn't feel like posting pics as the playfield is currently taken apart. I can send some pics if interested or set up a time where you can see it. Welcome davideokills and Rico_Roughneck. Thanks for posting your project pins here! That Williams multi-ball Pokerz looks really interesting. The Pinsider buyers lament applies here: "if only I were closer." Interested in the jokerz, message me. I have a project f-14 but missing way to much. Great thread, I love projects. Thanks Pecos! Of course someone asked about the project High Speed I didn't really consider selling when I listed the cleaned up one. I posted some pictures of the project in the listing for this one. Playfield is pretty wrecked but it's complete and in good shape besides the playfield wear. They sell an overlay and I had planned on using it on this one. I'm asking $680 in the condition it's in or trade of similar value.